Does Green Tea Prevent Alzheimer's Disease? Recent articles and research reports are extolling the virtue of green tea as a potential Alzheimer's Disease prevention. Fact or hype? Read on to learn more about the current hubba bubba around green tea extract. One of the hottest topics in the Alzheimer's community this week is about Green Tea and its effectiveness in preventing Alzheimer's. It seems the topic really got hot thanks to new and existing research that just popped up on media radar screens. This article in the Tufts Health and Nutrition Letter certainly added some fuel to the fire - Green Tea Protects Brain Cells. Now to the new and existing research. Before we start, keep in mind the researchers used a powerful extract of green tea compound called EGCG (epigallocatechin-3-gallate). When you read the word extracts this usually means a "high octane" version of what you could usually get drinking a cup of tea. It also usually means that you might have to drink hundreds of cups of green tea in order to get the same effect that comes from ingesting the "extract". A second new study by Swiss researchers, published in the European Journal of Clinical Nutrition found that green-tea beverages were associated with increased activity in the dorsolateral prefrontal cortex of the brain. This is a key area for working memory processing. 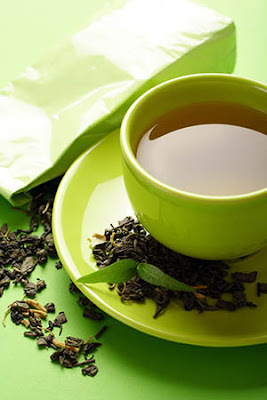 The researchers found the activity was greater still with the higher dose of the green-tea extract. No, this extract is not available for purchase. And yes, it is some kind of mega-dose. Another study used mice to test the brain-cell effects of EGCG in green tea. Chinese researchers, publishing their findings in Molecular Nutrition & Food Research. Researchers found that treatment with EGCG significantly increased the number of cells associated with neurogenesis. When mice were injected with EGCG, their performance in navigating a maze markedly improved a sign of increased spatial cognition. Can green-tea extracts block the formation of the amyloid plaques associated with Alzheimer’s disease? "British scientists, reporting their findings in the Journal of Biological Chemistry, formed “balls” of amyloid proteins in the lab similar to the toxic, sticky aggregations that attach to nerve cells in the brains of Alzheimer’s patients. Experimenters then added extracts from green tea and red wine to the amyloid balls. Both extracts caused the shape of the balls to distort in such a way that they could no longer bind to nerve cells and disrupt their functioning." Finally, these positive findings were under-scored by new and similar research at the University of Michigan, published in the Proceedings of the National Academy of Sciences. A multidisciplinary research team of chemists, biochemists and biophysicists investigated the structural effects of EGCG on amyloid plaques. They found that the green tea compound prevented the formation of potentially dangerous amyloid aggregates. In other words, "a flavonoid found in green tea, called ECGC, binds and changes the property of beta-amyloid, a toxic protein that accumulates in the brains of individuals with Alzheimer’s disease". Having written all of the above I would now direct you to this common sense article written by Henry L. Paulson, Green Tea and Its Effects on Alzheimer’s, that explains clearly and concisely what all this hubba bubba about green tea does, and does not, mean.